Owners Rob Fisher and Paul Mara contested the Gold Coast race last year and won PHS overall. Last December, with neither Fisher nor Mara aboard, Helsal 3 finished down in 15th overall in PHS. Prior to that, was PHS ninth overall in Cruising Division 1 at Hamilton Island. This time, with Fisher skippering and Mara (a Gundagai doctor who bought into the yacht just prior to the 2013 Hobart race), navigating, the boat should be back to her best. Originally Arthur Bloore’s ‘The Office’, Tony Fisher (Rob’s dad) and his family purchased the yacht and gave her the name of all their famous yachts, Helsal. 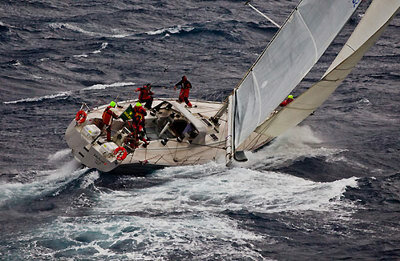 The yacht was raced with success in the late 1980s and early 1990s before they sold her.